What Flowers Are Native to Louisiana? The moist soils of Louisiana’s landscapes and bayous are home to many native flowers that thrive in the heat, humidity and abundant rainfall of this semi-tropical southern state. Preserving Louisiana’s native flowers involves protecting their natural habitats and choosing native flowers for landscaping projects over non-native, invasive species. Many Louisiana residents select their state’s native flowers for low-maintenance flower gardens and landscape designs. The official state flower of Louisiana, magnolia (Magnolia grandiflora L.) is an evergreen tree that produces numerous large, white-colored fragrant blossoms in mid-spring into the summer. Its red seeds form in the summertime. Also known as southern magnolia, this tree is a member of the Magnoliaceae family. 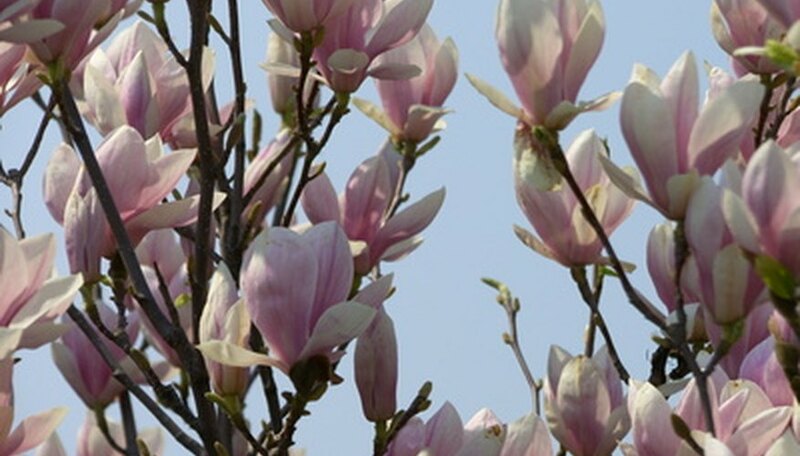 The magnolia tree is native to Louisiana and the southeastern region of the United States. Mature magnolia trees can grow to 100 feet in height, and they thrive in moist soil and full sun to partial shade. Declared Louisiana’s official state wildflower in 1990, Louisiana iris (Iris giganticaerulea) grows in moist to wet soils, as is found in the Louisiana bayous. A perennial member of the Iridaceae or iris family, it thrives in full sun, and its bluish purple flowers bloom in pairs at the top of its stem that grows less than 4 feet tall. Southern arrowwood (Viburnum dentatum L.), a perennial shrub or tree of the Caprifoliaceae or honeysuckle family, is native to Louisiana, Texas and the eastern half of the United States. It grows less than 15 feet tall in moist soil, and thrives in full sun to partial shade. Southern arrowwood’s white flowers blossom in early summer, and its purple-blue berry clusters ripen in August. In the fall, its leaves turn yellow to burgundy in color. This delicate flowering perennial herb is native to Louisiana and the mid to southeastern region of the United States. Diamond flowers [Stenaria nigricans (Lam.) Terrell] grow to 20 inches high, forming a cascading bush with numerous small, white or pink, four-lobed flowers. Its flowers resemble baby’s breath from a distance and is often called by that name. Diamond flowers belong to the Rubiaceae or madder family and requires moist sandy soil and full sun to partial shade. Its leaves turn black when dried.